Various social movements in Brazil and beyond that fight for the rights of indigenous people [pt] have harshly criticized the issuing of Decree Law 303 [pt] in mid-July 2012 by the Brazilian Federal Government via the Office of the Solicitor-General or AGU. 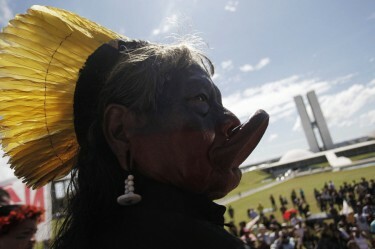 The law seeks to restrict the autonomy of indigenous lands in Brazil. a Portaria 303 determina, entre outras medidas, que as terras indígenas podem ser ocupadas por unidades, postos e demais intervenções militares, malhas viárias, empreendimentos hidrelétricos e minerais de cunho estratégico, sem consulta aos povos. Por um mero instrumento, a AGU desconstrói o direito constitucional indígena de usufruto exclusivo da terra de ocupação tradicional. Decree 303 determines, among other measures, that indigenous lands can be occupied by units, posts, and other military inventions, various infrastructure networks, hydroelectric and mining companies of strategic nature, without consultation of the [indigenous] peoples. As a mere instrument, the AGU has dismantleed the constitutional indigenous right of exclusive use of lands traditionally occupied by them. Those against the measure demand its immediate repeal as they consider it [pt] “an affront to rights guaranteed by the Federal Constitution and by international instruments like ILO Convention 169, a law in the country since 2004, and the Declaration of the UN on the Rights of Indigenous Peoples”. The decree comes at a time when the developmental policies implemented by the government of Dilma Rousseff have visibly collided with the rights of indigenous communities in the country. According to data by IBGE in 2010 there were over 800,000 indigenous Brazilians [pt]. The Belo Monte dam [pt] has been in the media spotlight, as it could be the third largest in the world if it is in fact constructed. According to a report [pt] by Global Voices in August, its construction had in fact been suspended by order of the Public Federal Ministry in the state of Pará due to, among other reasons, lack of consultation of indigenous peoples before the legislative decree that authorized its existence. However, the suspension only lasted a couple of days, as on August 27, the Brazilian Supreme Court decided [pt] in favor of the Solicitor-General, which sought the continuation of construction. Cases like that of Belo Monte expose the fragility of Brazil regarding its positions on its international human rights commitments, as was seen in 2011 when the Interamerican Commission on Human Rights (ICHR) requested by way of a cautionary measure that the Dilma government immediately suspend construction of the dam. O Brasil protesta contra a decisão, retira o seu embaixador na Organização dos Estados Americanos (OEA), suspende o pagamento da sua cota anual à OEA, retira o seu candidato à CIDH e toma a iniciativa de criar um grupo de trabalho para propor a reforma da CIDH no sentido de diminuir os seus poderes de questionar os governos sobre violações de direitos humanos. Brazil protests the decision, withdraws its ambassador from the Organization of American States (OAS), suspends payment of its annual dues, withdraws its candidate to the ICHR and takes the initiative of creating a working group to propose a reform of the ICHR in order to limit its power to question governments about human rights violations. Os territórios passam a ser terra e as populações que nelas habitam, obstáculos ao desenvolvimento que é necessário remover quanto mais rápido melhor. The territories become land and the indigenous populations live in them, obstacles to development that must be removed, the sooner the better. 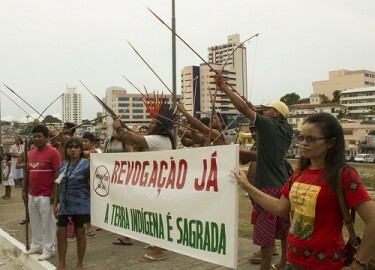 Indigenous protest against Decree Law 303/12 in Manaus. Photo by Fora do Eixo on Flickr (CC BY-SA). Decree Law 303 has prompted an unparalled unity among various social movements, like the indigenous leader members of the Committee GATI (Indigenous Environmental and Territorial Management), the Indigenous People of Brazil Network (Articulação dos Povos Indígenas do Brasil – APIB), the Indigenist Missionary Council (CIMI) and the National Association of Workers for Funai (the Brazilian government's indigenous affairs institution, Fundação Nacional do índio [pt]). o novo decreto de reestruturação da Funai, Decreto 7778/12, as PECs [Propostas de Emenda à Constituição] 038, que daria ao Senado a competência exclusiva para demarcação de terras indígenas e, 215, que transfere essa atividade para o Congresso. the new decree of the restructure of Funai, Decree 7778/12, the Constitutional Amendments 038, that would give the Senate exclusive competence to demarcate indigenous lands and 215, that transfers this activity to Congress. In response to actions taken in recent weeks, at the end of August the government proposed the suspension of Decree 303 “until the ruling on the suspension of the sentence of the Supreme Court concerning the judicial action related to Raposa Serra do Sol” (Global Voices reported [pt] on this territorial demarcation in 2009) and the “creation of a Working Group composed of the Ministry of Justice, AGU, Funai and representatives of indigenous peoples, with the objective of discussing the conditions established in Decree 303/2012 and other ways of making viable demarcation processes for indigenous lands”. The Indigenous People of Brazil Network (APIB) expressed its opposition [pt] to the proposed suspension, believing that this will “make latent the widely occurring risks of land conflict in the country” and promises to “keep on mobilizing and fighting for the full repeal of the Solicitor-General's Decree 303″. João Miguel Lima and Raphael Tsavkko Garcia contributed to this post.